Guide to Managing the Condensate for Condensing Water Heaters. For a comprehensive introduction to condensing water heaters, please read our guide. Over the last decade, the number of condensing boilers and water heaters being installed has continued to rise every year and all indications are that this trend will continue and eventually become mandatory due to their higher energy efficiency and cleaner emissions, compared to standard boilers. 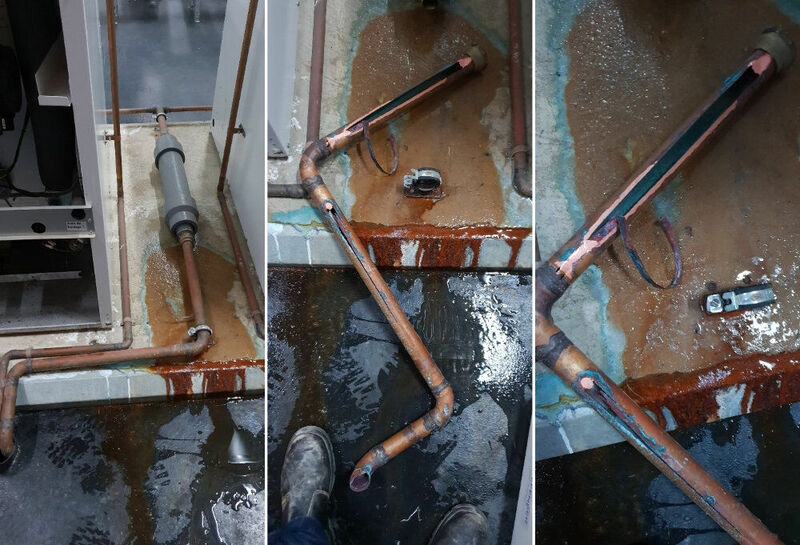 Condensing boilers discharge a corrosive condensate as a by-product of their operation. Because of the long-term effects of the sustained introduction of this corrosive condensate into drains and sewer lines, there is a growing awareness of the need to educate code enforcement officials, contractors, building owners, facility managers and homeowners of the need to neutralize this corrosive outflow and the means available to do this. What is Condensing Boiler condensate? Condensing water heaters achieve higher energy efficiency than standard boilers by condensing the water vapour in the flue gasses and using the latent energy recovered through this process to heat the return water going into the water heater. The condensing process is achieved by passing the piped hot flue gases through the cooler return water flowing back into the boiler. Flue gas starts to condense when it drops below its dew point of 55°C. This is why condensing boilers are designed to accommodate a return water temperature of 54°C or less. It is this resulting condensate liquid that is acidic and requires treatment to avoid damage to piping systems, sewerage systems and other items it may come in contact with. How much condensate is produced? A general rule of thumb, 3.5 litres of condensate is produced for every 30kw of input providing the boiler is operating in full condensing mode. A boiler having 30kW of input operates for 1200 hours annually will produce approximately 4200 litres of condensate. The acidic level of the condensate is measured as pH. Most condensate from natural gas appliances will have a pH of between 2.0 and 4 with 7 being neutral. The actual pH will vary according to the actual chemical makeup of the fuel that is being burned. Condensate contains different types of acids that are corrosive to many materials and contain concentrations of nitric, nitrous, sulfuric, and sulfurous and hydrochloric acids. These acids can become more concentrated by repeated condensing and evaporation on heat exchangers and flues. A pH of 4 can damage drainage pipes, septic tanks, treatment plants and other materials handling waste water. The pH scale is not linear. Each whole number step below 7 is 10 times more acidic than the next higher number. Treated condensate should be as close to 7 (neutral) as possible with 5 being the minimum. Most national and state codes prohibit anyone from allowing acidic liquid into a drainage system without treating it to raise its pH. 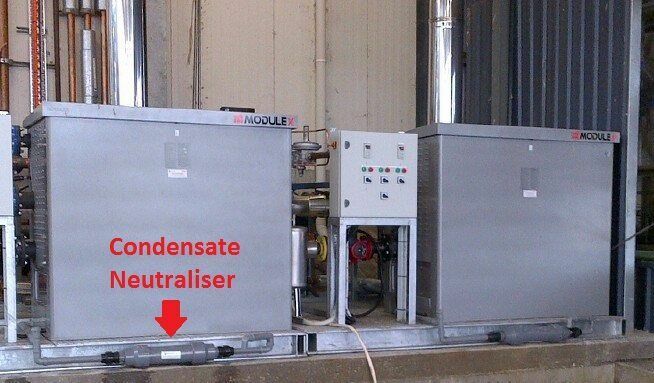 To increase the pH to acceptable levels, whereby it no longer has the potential to damage the sewer system or environment, a condensate neutraliser should be installed. Condensate neutralisers are designed specifically for this task, and consist of a tank or module containing alkaline limestone aggregate or chips. Automatic Heating offers several models that accommodate water flow rates from 6.05l/hr to 155l/hr depending on the size of the condensing water heater system. The acid is converted to water, carbon dioxide and mineral salts when exposed to the media. The carbon dioxide will generally stay diluted in the water and pass out of the neutralizer. The mineral salts generally settle at the bottom of the neutralizer. Over time the media dissolves and must be replenished. If applied properly and maintained regularly, damage associated with acidic condensate in the drain piping can be avoided. 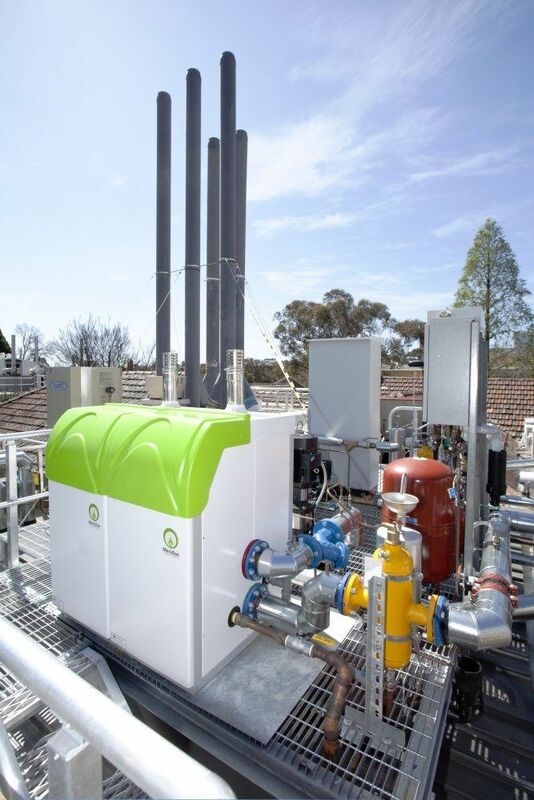 The above image shows Modulex high efficiency condensing boilers with condensate neutralisers installed in the pipes that connect the boiler drains to the point of discharge. The condensate expelled from a condensing water heater is acidic with a pH of between 2 and 4, so it is critical that the appropriate materials are used in all piping where this liquid is present. In high temperature areas, like the flue, stainless steel must be used to prevent corrosion. The low temperature piping, such as that which drains the condensate from the heat exchanger condensate draining system, should be PVC or ABS to also mitigate corrosion. This system normally consists of a short length of PVC or ABS pipe with a water trap to prevent exhaust gases from being expelled into the drain and building. The above image shows why copper pipe should not be used for condensate drains. The best way to check if the condensate neutraliser is working properly is to test the treated condensate with a pH meter. pH meters are available at a reasonable cost and should be added to the technician’s tool arsenal. All manufacturers of condensing boilers recommend annual maintenance and the service technician should check and service the condensate neutralizer during this service. It is the responsibility of the plumbing professional to follow state and local plumbing codes including proper disposal of condensate and equally important for the end user to provide ongoing maintenance ensuring proper function of the unit. Damage can occur underground and in unseen, remote locations. Imagine digging up your basement floor to replace a rotted out metallic drain line! Condensate from condensing boilers is acidic and corrosive to many materials and should be treated to maintain a pH of no less than 5 before disposal. There can be a wide variation of the pH of condensate from condensing appliances due to the chemical make-up of the gas being combusted or from the way in which the appliance is operating in a particular application. A fully condensing appliance will produce up to 3.5 litres of condensate per hour for every 30kw of input. The neutraliser media is reacting with the solution to raise the pH and does need to be replaced. Most manufacturers recommend replacing media and checking operation at least annually.